The 2017 Improvements mark the seventh project in Gilbane’s successful partnership with the Boston Red Sox. Gilbane successfully beat winter conditions and an aggressive schedule to safely complete improvements and renovations at Fenway Park. The renovations were completed in time for the Boston Red Sox season opening day game vs. the Pittsburgh Pirates on April 3 – marking nearly 105 years since Fenway Park hosted its first professional baseball game on April 20, 1912. 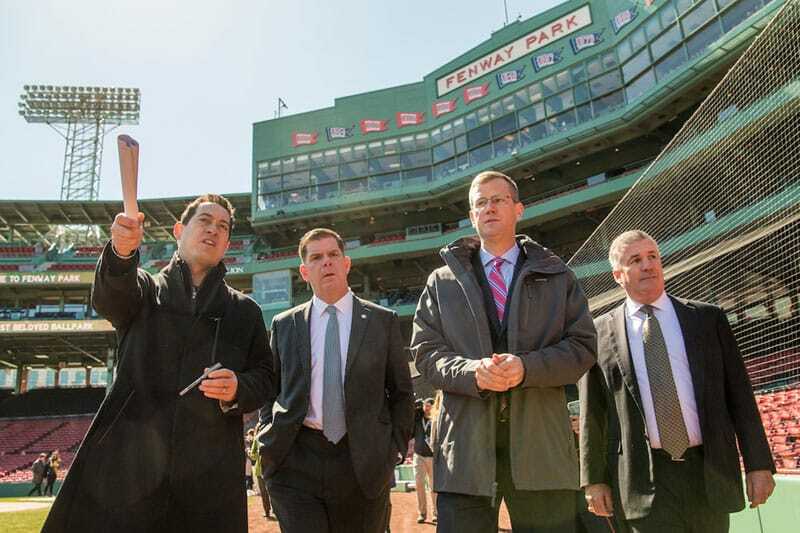 The 2017 Improvements mark the seventh project in Gilbane’s successful partnership working at Fenway Park having completed projects in 2007, 2010, 2012, 2014-17 with this year’s project being the largest at Fenway Park in six years. The depth of both the home and visitor dugouts has been increased by moving the front rail of the dugouts forward three feet, providing better circulation, improved sight lines from bench seating areas, and additional space for storage of bats and helmets. The field wall between the dugouts has been moved forward the same three feet to align with the dugout expansion, allowing for the addition of a new row of seats in the area from home plate to each dugout, and additional rows of seating behind the camera pits on the first and third base side. A total of 124 new seats have been added. The new, relocated field wall houses new televisions and built-in antennae systems which required significant coordination among all parties involved. Notably, four new day-of-game suites have been constructed on the State Street Pavilion level of the ballpark. Two on the first base side adjacent to the existing “B Suites,” and two on the third base side adjacent to the existing “K Suites.” The new party suites offer great views of both the playing field and the Boston sky line and can be used as individual spaces for 12 people or combined to create single, expanded suites accommodating 24. Additionally at right field, several rows in the back of the right field grandstand were removed this offseason to accommodate the construction of the new “Tully Tavern” bar area. Terraces with swivel stools, tables and standing room spaces feature charging stations and 64-inch televisions. Other projects include the right field foul pole, “Pesky Pole,” which underwent extensive structural repairs to reinforce areas that were impacted by general wear and tear over the years. A new removable field wall system has been installed in front of the bullpens, in the same location and with the same dimensions, to better accommodate non-baseball events that continue to be popular at Fenway Park. Additionally a new video board was installed in right field, replacing the Cumberland Farms sign that previously occupied that space and requiring significant structural reinforcement.